Our work to promote free expression in Southern Africa is coordinated by our Regional Secretariat and supported by our extensive network. 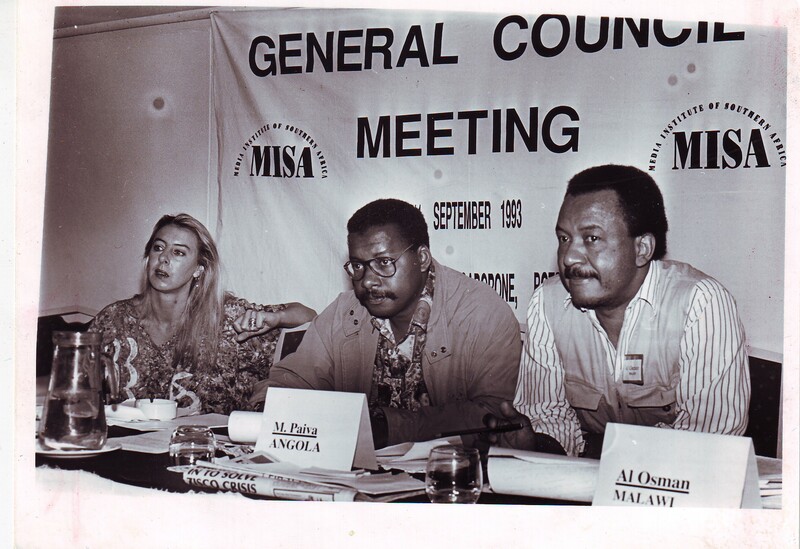 MISA Governing Council (founding) Members (left to right) Gwen Lister of Namibia, Angola’s Mario Paiva, and Malawian Al Osman pictured at the MISA Annual General Meeting, held in Gaborone, Botswana, in September 1993. MISA’s work to defend and promote free expression across southern Africa and more broadly across the continent is coordinated by the Regional Secretariat, based in Windhoek, Namibia and made possible by the extensive network of Chapter offices, members and partners across the region. This participatory corporate governance structure is provided for in our constitution and consists of the Trust Funds Board (TFB), the Annual General Meeting, the Regional Governing Council, the National Governing Councils, the Regional Secretariat, the Chapter Secretariats and our membership base across southern Africa. We are a membership-based non-governmental organisation (NGO) with 11 National Chapters within the Southern African Development Community (SADC) – Angola, Botswana, Lesotho, Malawi, Mozambique, Namibia, South Africa, Swaziland, Tanzania, Zambia and Zimbabwe. The MISA National Chapters are registered as either NGOs or Trusts according to the laws of their country and are made up of individual and institutional members promoting the right to freedom of expression and access to information. The representatives of these members are elected to form national and regional governance structures in accordance with MISA’s rules and regulations for Chapters and the deed of Trust. and providing the organisation with effective governance and leadership. The MISA Education and Production Trust Fund Board (TFB) was established on 24 June 1994 by MISA’s founding trustees, retired judge John Manyarara, Dr Gilbert Mudenda and Dr Bojosi Otlhogile. The TFB is independent of MISA’s Regional Governing Council and has the power to dissolve any MISA structure, take disciplinary action against any unit of MISA and make the final decision in any matters of conflict within the organisation. The trustees, who are nominated by MISA members and appointed by sitting trustees, are prominent southern Africans known for their commitment to media freedom. As well as media workers, our trustees include lawyers, business consultants and human rights and freedom of expression activists. This provides a diversity of skills and experience to the organisation’s leadership.